Women in Islam are like the pillars of the religion. They stand united and act as a support to the family. 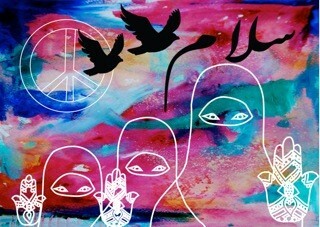 The message that I'm showing in this piece is about women in Islam and what their role is in promoting peace. For this artwork I have used symbols to indicate peace in the religion. For example flying doves carrying olive branch are considered as a symbol of peace in many countries, the olive tree is considered to be healthy and is a symbol of goodness and purity. The dove appeared as a sign that a flood, which was sent as a punishment, would abate. The circle, which is the 'Western' symbol of peace, has N and D in it. It stands for "nuclear disarmament". This symbol was adopted by anti war activists and has become a sign of peace. I used white strokes to make my design, as white is the color of purity. The women in my art piece stand united. The various colors in the background represent that no matter what country they come from, they are always there to support their sisters. The women are standing with the Fatima hand; the name comes from Fatima Zahra who was the daughter of the prophet Muhammed. The Five fingers also represent the five pillars of Islam. In Islam the hand, the eye, and the number five are of great importance. In present day, this is used as a charm for protection; it has also been used as a sign for peace and hope in the world. Women are the protectors of the family and the keepers of the culture. They are veiled to protect their modesty and conserve their traditional ways. In Arabic, "salaam" means Peace, written here while using the 'nastaliq' script, which is a Persian-Arabic style of calligraphy. I believe Islam is peace and women play a major role in contributing to the cultural and heritage of Islam.